People wash vehicles out on the road in Berg Street using water from a broken municipal pipe. Shop owners say the pipe is broken repeatedly by the people who use the water from it. 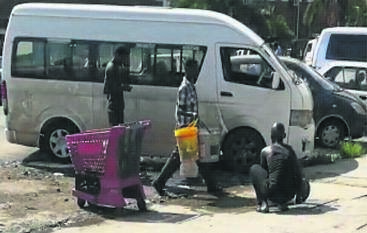 Some of the city’s CBD streets have become a car wash of sorts following several weeks of people using fresh water from broken municipal pipes to wash their vehicles. 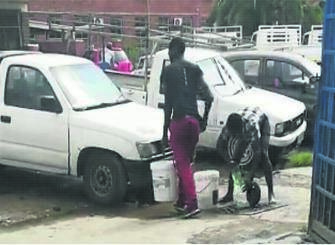 Shop owners in town, especially those along Pietermaritz, Church and Hoosen Haffejee streets, are fed up with people washing vehicles outside their store fronts, and in some cases also having a bath. Footage taken by one of the irate shop owners shows several people crouching around a broken water pipe on the road side. Some use the water to wash their shoes, while others fill buckets and water bottles. Other footage shows people washing bakkies and taxis, taking water directly from the broken pipe. A shop owner on Hoosen Haffejee Street, who asked not to be named, said they had been struggling with the issue for several weeks with no resolution in sight. “For weeks on end people have broken this pipe. “The water runs day and night without stopping. It’s complete abuse. “The guys are literally having a bath in that water. It is ridiculous,” said the shop owner. He said that the matter had been reported to the municipality and that they had fixed the pipe, but it would be broken almost as soon as it had been repaired. The shop owner said the City had fixed the leak on Hoosen Haffejee Street on Wednesday and had covered the pipe to make it more difficult to get to. But he was concerned people may dig it up. He said previously the municipality had kept replacing the broken pipe with a plastic pipe that could be broken easily. 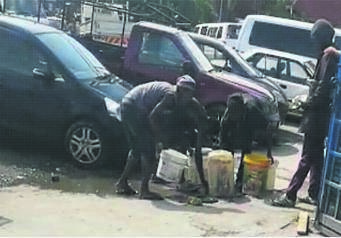 “Some of the whoonga addicts appear to be filling buckets of water and then charging people to wash their cars. “I have spoken to some of truck drivers washing their cars and they tell me to mind my own business. “The trucks and taxis block our store fronts and cause chaos with the traffic. A shop owner in Pietermaritz Street said people were also using broken municipal pipes to drink from and wash vehicles. He said in this instance, people were not purposefully breaking the pipes, but the pipes were poorly maintained and sprung a leak every second week. “We have tried to speak to them but we get sworn at,” he said. Msunduzi municipal spokesperson Thobeka Mafumbatha said: “During our clean-up campaigns we do attend to the issues of children living on the streets, illegal connections and abuse of water resources. “We also have security that deals with illegal actions such as vandalising municipal properties. “The municipality will investigate the abuse of water and we appeal to the businesses to inform us so that perpetrators can be dealt with,” she said.